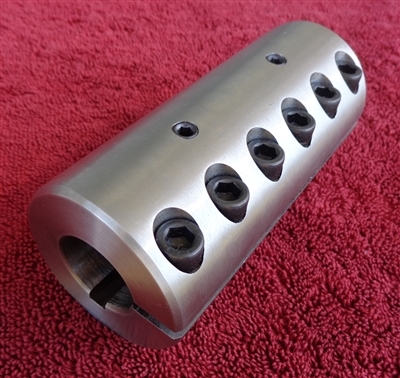 Machined and balanced from billet stainless steel. No rust, no corrosion, the last coupler you'll ever buy!! Fits 1" prop shafts and 1 1/8" output shafts. Measures 4 7/8" long and 2 1/4" in diameter. Our coupler runs concentric with the prop shaft due to our unique balancing grooves, no more wobble!! This is the same style of coupler I designed for Schiada Boats. Utilizes 6x 5/16" bolts for clamping and 2x set screws for safety. Standard 1/4" keyway. Coupler comes with all hardware described.